After months of development we’re excited to announce the official launch of a completely updated and enhanced version of Erik Dalton’s groundbreaking eCourse: Posture, Pain, Performance. Posture, Pain, Performance is Erik Dalton’s all time bestselling course. It provides you with a thorough grounding in his innovative Myoskeletal Alignment Techniques. If you’ve never taken one of Erik Dalton’s courses, we suggest you begin with this course. 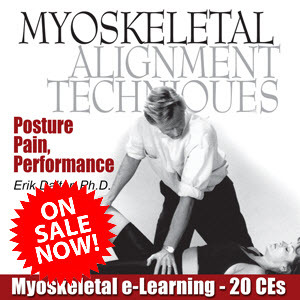 It will provide you with an comprehensive understanding of the principles behind MAT and is your first step toward Master Myoskeletal Therapist certification. Completing this course earns you 20 CE hours and is recognized by NCBTMB and most State Licensing Boards. On completion, you’ll receive a handsome diploma and certificate of completion to submit for license renewal, as well as to proudly display in your office. You’ll also be listed in our online directory of bodyworkers with MAT training. You save big! Because these new eCourses are delivered online, we don’t have the cost of producing printed books, manuals or DVDs. We can pass those savings onto you. The Home Study version normally sells for $319, but with the discount this week, you can get the Posture, Pain, Performance eCourse for just $199. And there’s no shipping cost with eLearning! So you save even more! There is no waiting around for your course to arrive in the mail. Once you order, you’ll have instant access to the course and can enjoy it immediately. Order today because this offer expires November 25th.